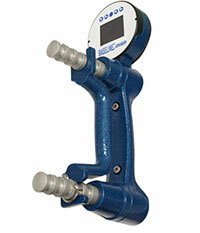 Baseline Poly-Functional load cell dynamometer features an adjustable 5-position handle to accommodate all hand sizes for accurate and repeatable grip and pinch strength measurements. Results and live test data are displayed on large oLED display. Battery operated. The standard model is for clinic use. The deluxe model for workers comp, FCE (functional capacity evaluation) and research applications. Data is stored for instant recall. The instruments are Bluetooth enabled. The maximum (peak) value is shown for each scan. The average (mean), standard deviation (SD) and coefficient of variation (CV) are calculated and displayed for each series of scans. Results can toggle from lb to kg. The exertion and rest times are set by user. Fatigue Test: requires 1 extended time scan. Permits comparison of total work (strength exerted) over two or more user defined time periods. The Research model is for workers comp, FCE (functional capacity evaluation) and research applications. 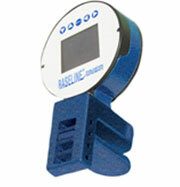 Baseline Poly-Functional load cell pinch gauge features an adjustable 5-position handle to accommodate all hand sizes for accurate and repeatable pinch measurements. Results and live test data are displayed on large LED display. Battery operated. The standard model is for clinic use. The deluxe model for workers comp, FCE (functional capacity evaluation) and research applications. Data is stored for instant recall. The instruments are Bluetooth enabled. The maximum (peak) value is shown for each scan. The average (mean), standard deviation (SD) and coefficient of variation (CV) are calculated and displayed for each series of scans. Results can toggle from lb to kg. The exertion and rest times are set by user. The sets includes the grip and pinch strength dynamometers and a plastic finger goniometer (12-1014) in a carrying case. Notice: The clinical models on this page are currently not available for sale in Canada.